I had the privilege to return to Israel-Palestine in May 2002, thanks to the kindness of many family members and friends, and an accompanying commission for a piece of my work from two very generous persons among them. We went during the Second Intifada in the wake of several suicide bombings in Israel that led to the siege at the Church of the Nativity in Bethlehem. We went with excitement yet with heavy hearts hoping somehow to be agents of reconciliation and peace and to offer a measure of support to the Palestinian community with whom some of us had had contacts. We went more specifically to offer some help to the Christmas Lutheran Church and International Center in Bethlehem which had sustained some significant damage when Israeli forces had come through the compound on a manhunt.. They had shot up the place, taken computer hard drives, destroyed office equipment, and painted slogans on the walls of a beautiful multimedia arts center. It was a difficult ten days for me. I had grown up in Israel and had identified with my Israeli friends as victims of a terrible history and with the insecurity they felt surrounded as they were by people who now resented their presence. It was disillusioning to see this retributive anger and violence, senseless it seemed, directed everywhere and nowhere except to hurt and humiliate and obliterate people and property, innocent or not, here only a generation and a half after the haulocaust and the establishment of a refuge for them in the State of Israel. 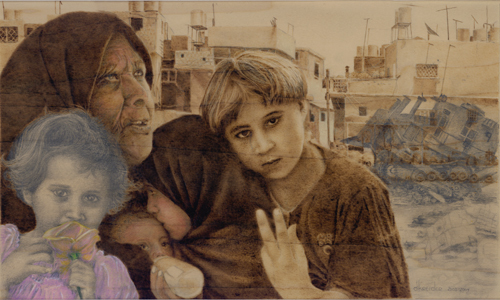 The image I have portrayed here is Bethlehem, a Palestinian town, a refugee camp that is part of it, and a collection of faces I photographed in the town. It took me two years to complete this, one of the most difficult pieces from an emotional standpoint I've ever done. I had gone hoping to create a memento of beauty for the kindness of my friends, something that captured the spirit of compassion and the soul of the place.. But the visual images I had hoped for just were not there. While there was much, very much beauty and resilience and hope in the spirits of the people we met, the telling images in the landscape belied the inner fortitude that keeps them going in the face of it all. The imprints on the backdrop reveal the dark side of Israel- Palestine, the burnt colorless landscape of loss, grey shadows of death and instruments of destruction, a D-9 caterpillar used for house demolitions, images that are the stuff of nightmares real and imagined there. I believe there is a change to the psyche that occurs when one is violated, whereby one's fundamental belief in the goodness of humankind is shaken, and that in that violation is a loss of innocence when one has stared in the face of evil. It is written in the eyes of these women, in the grief cast heavenward, in the memory of a sweet daughter untimely torn from us, in the kiss of a sister holding all she has in the world, in the sadness of the girl holding out two fingers which speak volumes ..twice refugees, twice bereft, reduced to begging as she is now for "two sheckels". I believe the lines of nations, states, and ethnic differences are artificial distinctions in the context of the human family. As such we as Americans, or whoever else we are, are as complicit as anyone in our world's inhumanities when we fail to address them. This could be a picture also of Falluja or Najaf, of Mosul or Baghdad. It could be Gaza or Jenin. Changing the faces and the architecture, it could be Sudan, or Tel Aviv, Rwanda, parts of the former Soviet Union, or Ground Zero. In the cycles of violence our human family has been violated and we have all lost our innocence, and we must find our way back. We must learn to make peace and rediscover the power of grace and forgiveness to rise above our own impulses to lash out which we condemn in those we call terrorists. I believe we must acknowledge that our resorts to violence to stop violence are as much a part of the problem as the acts of terrorism we deplore, and that neither are constructive in the pursuits of justice and peace..
For all I've said about the dark side in this picture, there is also beauty and hope in the faces of these women and a baby who will grow up to embody something of the legacy of identification and care they now leave for each other. They are holding each other, bound to each other in life and death. In the differences in their garb are the symbols of the differences of their faiths, Muslim and Christian; and as for the "departed spirit" of the little girl in front, she could be Jewish as easily as she could be Palestinian, or any one of our daughters or sisters who identify with these women's grief.. For after all, in that day I believe we will all recognise that we are one family. The only color in this picture is a very pale dusty rose, symbol of the hope we cling to in this life, albeit very dim at times. For me as a Christian it is symbolic also of the hope that came in the form of another baby born in that town some two millenia ago, around whose birth were reports of angels in the heavens, singing, "Glory to God in the highest and on earth peace, good will towards humankind". That baby grew up to teach us to love our enemies and do good to those who hate us, to forgive those who abuse us, to absorb the violence, and to go the second humiliating mile. It is in that embodiment that I see evidence of a loving God reaching into our world of time and space with a word or two about the meaning of life. And in that kind of spirit, I can take heart and take hope for our human experience..